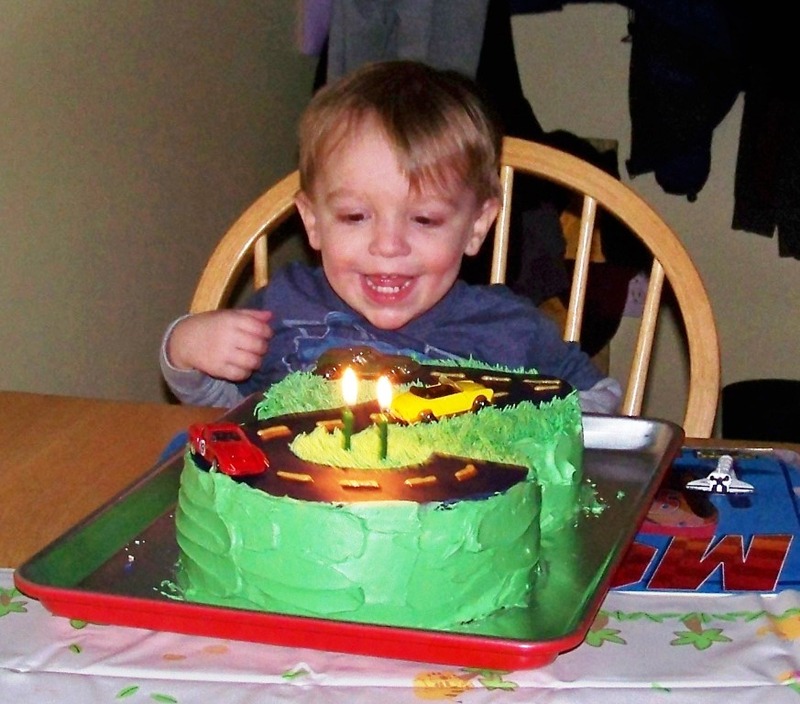 We celebrated my son Lincoln's 2nd birthday last week. 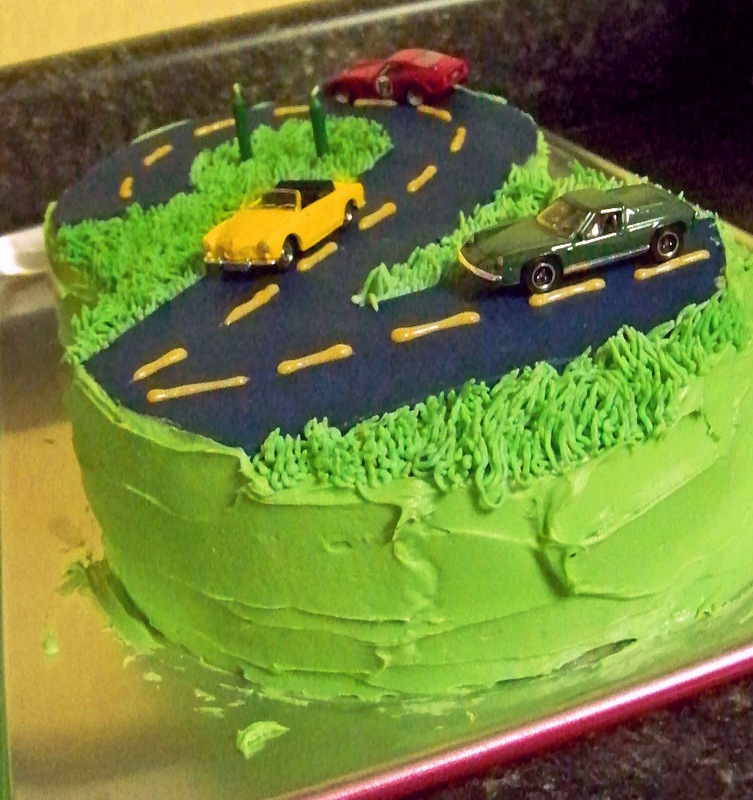 He is absolutely obsessed with cars, so I knew that I wanted a car theme. Initially, I planned to try to make a car-shaped car. 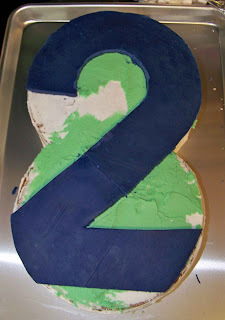 In my Thirty Before 30 list, I included that I wanted to learn to work with fondant, so that seemed a good opportunity. My husband is incredibly wise, however, and he observed that that seemed like a pretty complicated cake for my first fondant venture. He suggested I simplify, so I did a google image search on "car cakes" to get some ideas. I found a 9 x 13 that had a road frosted on it with cars, and that seemed like a good direction. So I did a google image search on "road cakes" (or something similar), and knew I hit paydirt when I found this one. It's perfect! Two round cakes (MUCH easier than trying to shape a car out of cake), and I could incorporate fondant into the number 2. 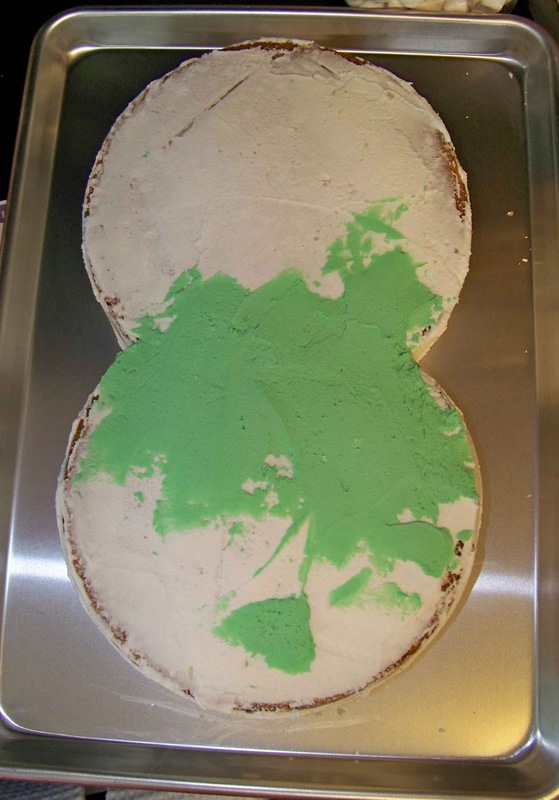 So from there, I copied the picture into Microsoft Word and used the insert shapes function to insert circles, arcs, curves, and lines to overlay the cake image to approximate a blueprint for my cake. (sidenote: This is a technique I use a lot to approximate a shape. You could do something similar by printing out the cake you want to copy and tracing over it, or I imagine photoshop and maybe piknik also have similar capabilities. That's just what I know how to use. 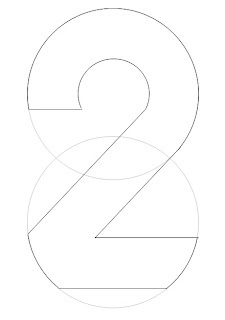 If you're interested in learning more about Word's drawing capabilities, shoot me an email and I'll find a tutorial.) Here's the "blueprint" I finished with. I didn't do a detailed tutorial, but I did take pictures at each step. 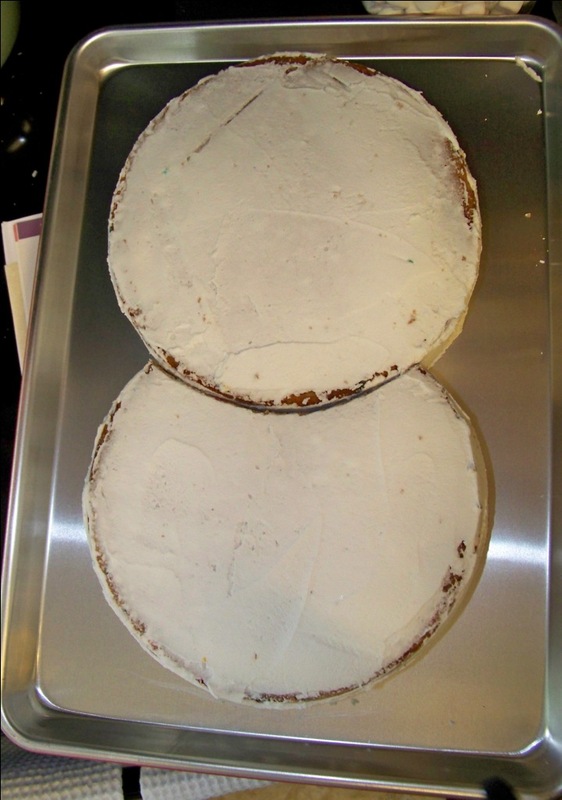 I started with two two-tiered 8" round cakes that I put a crumb coating on. 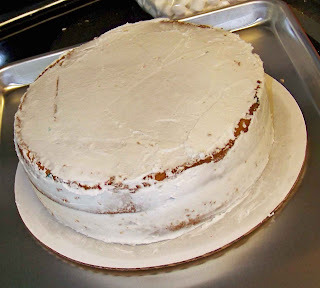 I didn't take any pictures of the stacking or crumb-coating process (I am not an expert AT ALL), but if you have any questions, go ahead and ask, and I'll find a link to help explain. I used two types of frosting. I used the Wilton buttercream recipe for the crumb coating and for the grass on the top of the cake. Then I used cream cheese frosting from a tub for the sides. Next I printed out the top of my blueprint (scaled to 8"), so that I knew where to cut one of the circles to fit the two together. 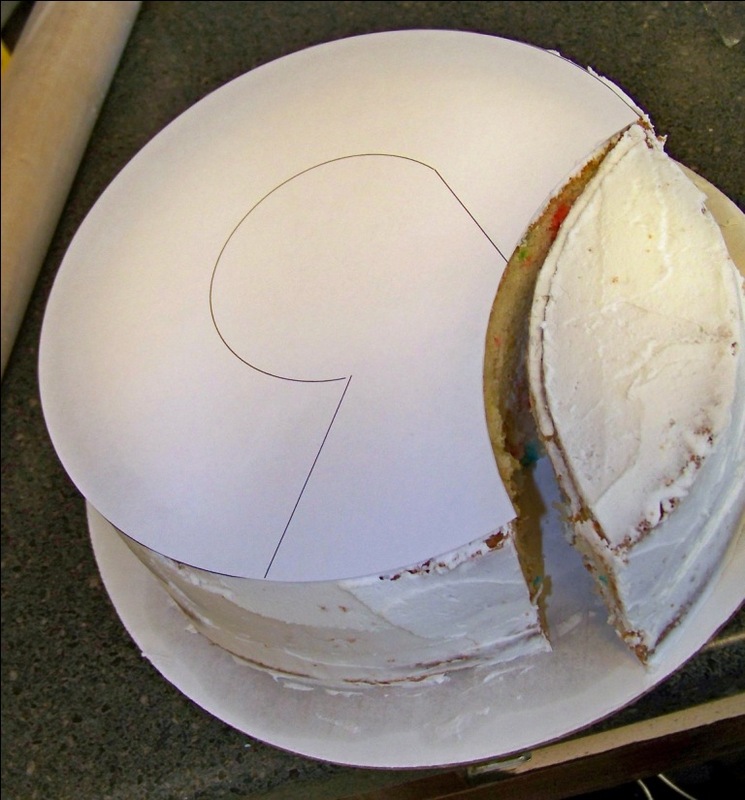 Because I used buttercream frosting and refrigerated my cakes after the crumb coat, I could set the paper right on the cake to mark my line. 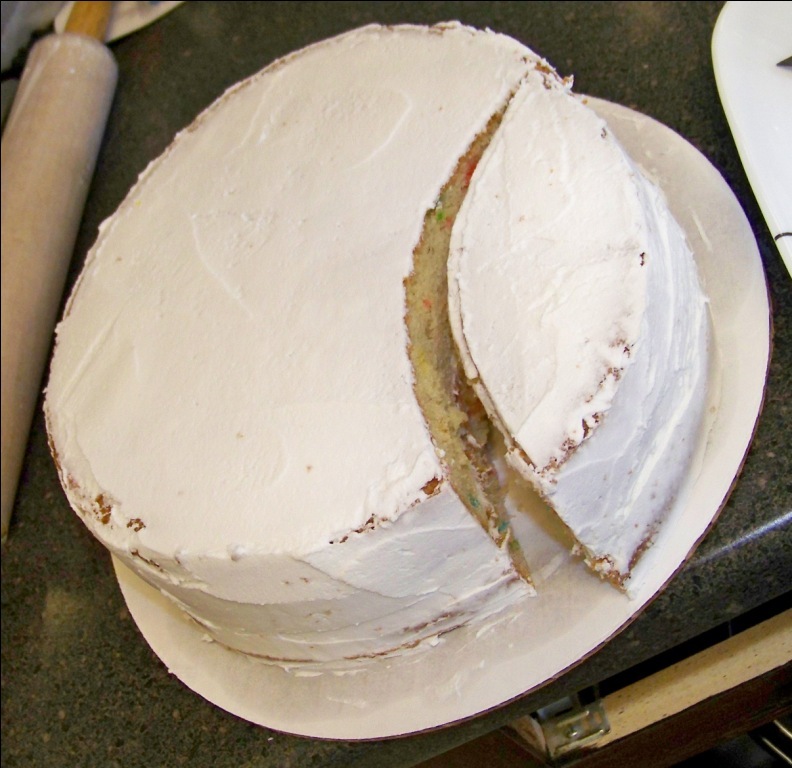 After making my line, I cut the cake a little bit further in to ensure the cakes would fit together. 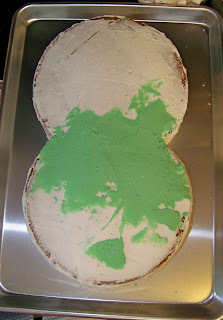 Then I used the buttercream I'd already mixed up for the grass to even out the transition between the two. It isn't pretty, but it gets covered up, so it's not a big deal. 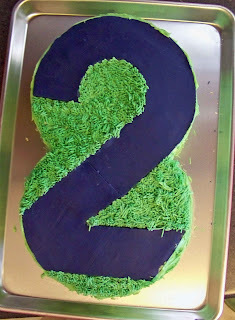 Next, to make the 2 I had decided that rather than fondant, I would try this idea for modeling chocolate. I had come across this a while ago, and was intrigued because the number one criticism I've heard about fondant is that it tastes gross. I have been wanting to try marshmallow fondant to see if that's any better, but I figured nothing would be easier than heating up chocolate and adding corn syrup. 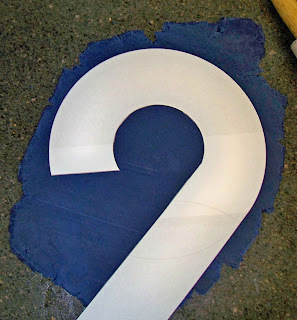 It worked like a charm, though I did learn to make more than I think I'll need since I ended up making more, but I did find it was easier to do the 2 in two parts. I printed out my blueprint (again scaled to 8" which meant I needed to print it out on two pages and then tape it together) and cut out the 2. I placed the top half on my rolled out "circle" of modeling chocolate, just cut around the pattern, and then placed it on the cake. I then rolled the chocolate out again and did the same thing for the bottom half. I left a little overlap so that I could cut the transition as close as possible after placing most of the bottom half on the cake. The transition's not too bad. If you look closely, you can see where there's a line in the middle of the cake, but by the time I finished, it blended really well. Next I frosted the sides with the cream cheese frosting. I colored it and the buttercream to be as close to the same shade of green as possible, and I think I got it REALLY close. I was pretty proud of that, actually. The next step was one of the most intimidating. 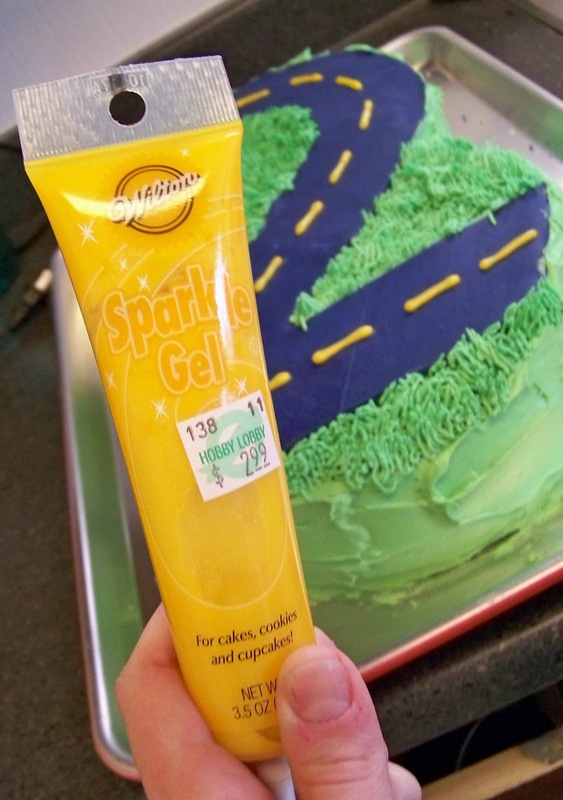 I had never tried frosting grass, but I knew there was a tip for it, so I just googled the number for the Wilton grass tip and picked it up at my local Hobby Lobby. When it came time to do it, I googled it again and watched the video tutorial. I practiced a few times and then just started around the border of the 2 and worked my way out. Almost finished, and I was feeling pretty good! The final step was the yellow line, and for that I used some Wilton sparkle gel I had picked up at Hobby Lobby. 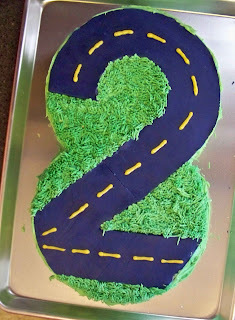 I am not particularly good at piping, but it was easy to use and the little hesitations aren't too obvious. We took it over to my in-laws to add the candles and the cars, and then it was done! How creative! It looks like he loved it! great job! thanks for the tutorial!!! It's fantastic!! What a super idea and well done!! 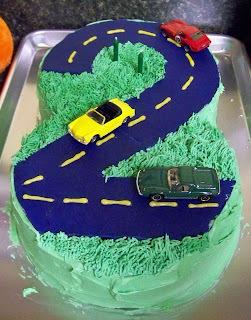 That's an awesome cake. Good work! Bravo!!! We had a little bday goodie for Linc 2 weeks ago, but he wasn't in nursery... and then the entire nursery staff was sick yesterday ;(... but we DO have a goodie for him and we will sing a little diddy for him too for his bday. So cute! 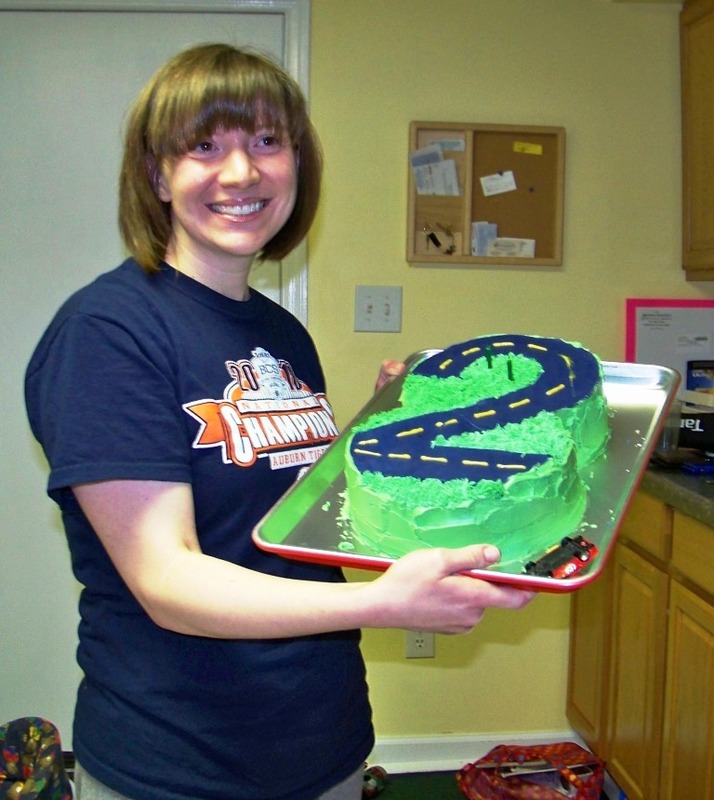 Wow Kelli, great cake! You're so brave! Now, if you could just make a pillow to match that would be perfect for his room, don't you think? Thanks so much for sharing on Craft Schooling Sunday, great to see you. 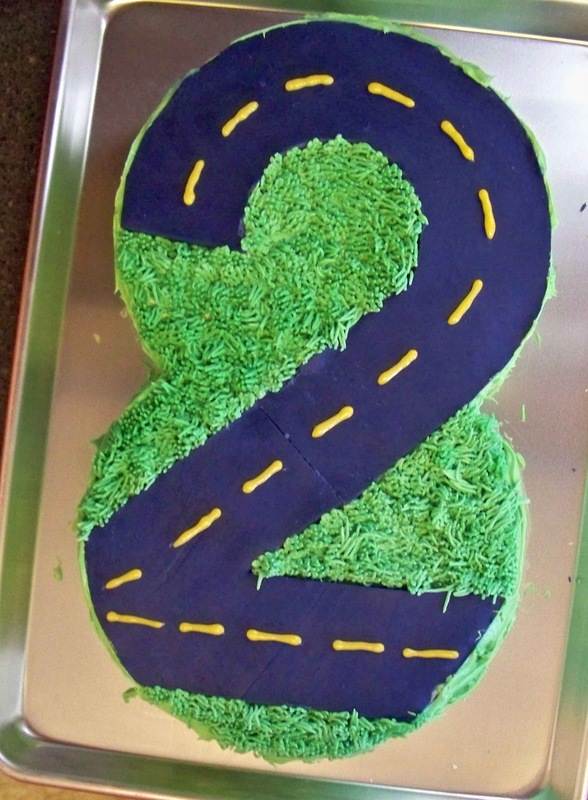 What an awesome cake!! It turned out amazing! SO cool, I'm bookmarking this for my little guy's b-day! 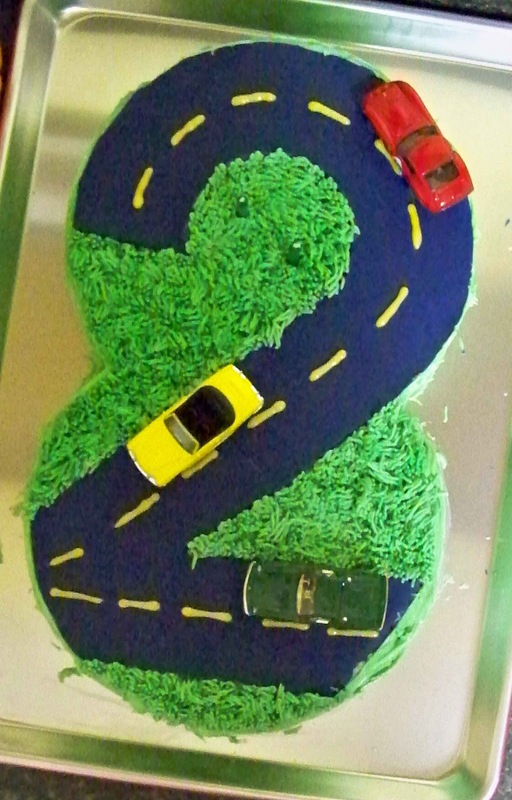 This cake is too cute. Came over here by way of Bubbly Nature. Very COOL! You did a great job on this cake. He looks so happy too! Love it! This is incredible! And a great tutorial! I would love for you to link up to my Ten Buck Tuesday link parties! What did you use as the road? Thanks for the great instructions! 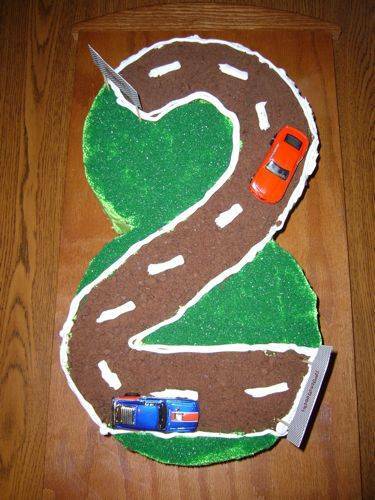 Think I will try making a similar one for my son's 2nd! Thanks for sharing! I made a cake for my son's first birthday, but I really know nothing about cakes. 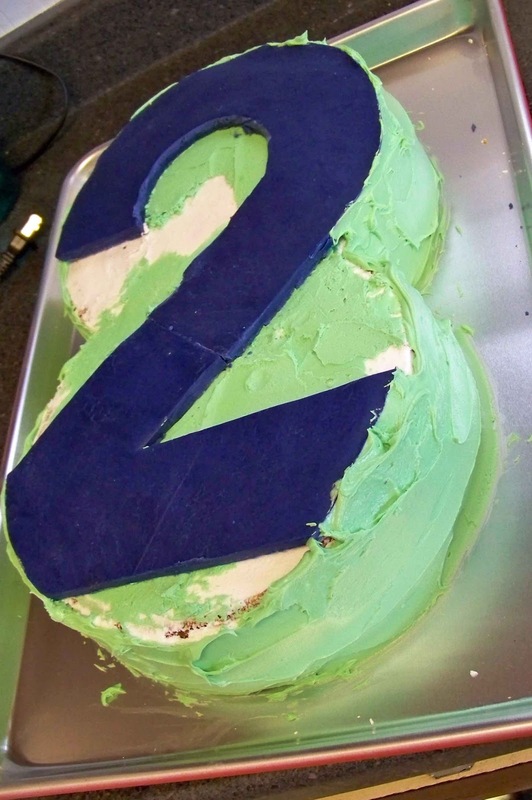 Why use a different frosting on the sides than on the top?